National Auto Sound & Security carries a full selection of Pioneer Car Audio on display. 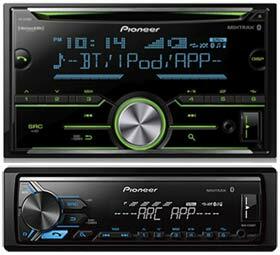 Buy it now and have your Pioneer car audio professionally installed the same day, often while you wait! See our Install Me Today Coupon. Talk with an expert and see these stereos and amps demonstrated in person. Learn what’s best so you don’t make a mistake. + Get local warranty support! The best way to decide on speakers is to listen to them. We’ll demo the sound. You can even bring your own music. Hear the rich sound of Pioneer speakers today. And great bass packages are on display. Hear and feel the beat. See what makes Pioneer subs great! If you want to buy the right thing and get great local support at the same time, stop by and let us help you today. Whether it’s just a simple upgrade like replacing speakers or whether it’s a large project on your special vehicle. With Pioneer’s quality and National’s knowledge and dedication to doing it right you’re in good hands. Questions on Pioneer Car Audio?